The island of Naxos is an island of culture, with many elements of classical Greece being clearly present. Over the years, the appearance of Naxos has also be strongly influenced by its Byzantium, Frankish and Venetian pasts, all of which have left something quite unique and different. Naxos features especially fertile soil and produces enormous crops of both olives and grapes, and its very own Naxian wine has become something of a speciality of the island. With charming mountain villages, superb beaches and endless Greek sunshine, it is easy to see why the island has become so popular. 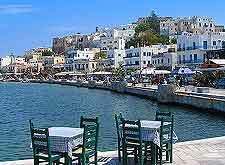 Whilst there is no official tourism centre here, the privately owned Naxos Tourist Information Center (NTIC) is worth a look and located within the capital town of Hora, directly opposite the main ferry quay. The island's sandy beaches have long been a major draw card and many are located close to Hora (Naxos Town). Lying on the southern side of Hora's waterfront is the town's very own beaches of Agios Georgios, while slightly further south are the stretches of both Agios Prokopios and Agia Anna. One of the most appealing of the beaches on the southern coast of Naxos is Mikri Vigla, which was historically a lookout spot for pirates. Today, Mikri Vigla is known for its rocky headland and superb windsurfing conditions. More information about Naxos Beaches. There is much more to Naxos that simply its delightful beaches and coastline, with a range of natural attractions to be found around Hora's historical centre, such as its Venetian Castle, and within the Tragaea region and its countless charming villages. Filoti is the biggest of all the villages within Tragaea and stands alongside Mount Zeus. Another notable mountain village on Naxos is Apiranthos, next to Mount Fanari, where simple Greek architecture and a trio of museums await. Hiking makes for a popular pastime around the mountains, with a number of recommended trails available, suiting all abilities. 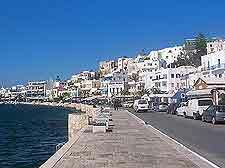 More information about Naxos Tourist Attractions. When its comes to historical landmarks and sights of archaeological interest, Naxos far from disappoints. The island's Portara gateway is known all over Greece and has become a true symbol of Naxos, with photos of the Portara regularly appearing on tourist information and publications relating to the island. Another sight to savour is Dimitra's Temple (Temple to Demeter), which is close to Sangri and enjoys a rather special hilltop setting. Those in the region of Apollonas should be sure to check out the enormous unfinished 'Kouros' statue, which was carved in the 7th century BC and abandoned before its completion, when significant cracks halted its creation. More information about Naxos Landmarks and Monuments. 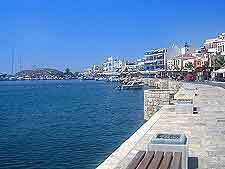 For many tourists, the attractions of Naxos are more than enough to satisfy any sightseeing needs. However, for others, the fact the Naxos is so close to a number of other leading Greek islands is just too much to resist, with day trips to the islands of Ios and Paros being eminently possible. Slightly further afield and still connected by frequent ferries are both Mykonos and Santorini islands, along with mainland Greece's city of Piraeus, the port of Athens. 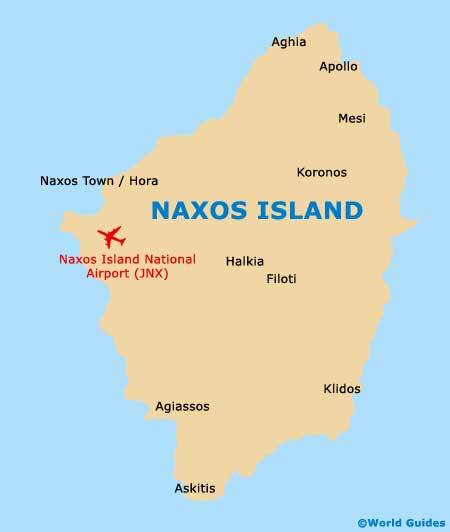 More information about Naxos Attractions Nearby.